A new water safety campaign is taking to social media to keep Great Lakes swimmers safe this summer as the hot sands and sparkling waters of beach season fast approach. Be Current Smart is the first water safety program to focus solely on the Great Lakes, said Elizabeth LaPorte, science outreach manager for Michigan Sea Grant, which founded the program and one of 30 university collaboratives nationwide that promote water research, education and outreach. The focus is important because the region’s abundant piers and unique, dangerous currents are hazards that broader programs can fail to address, LaPorte said. “It’s a little bit of a grassroots effort, you know, and a collaborative effort among a variety of groups that already exist, but this is the first Great Lakes campaign that is specifically targeted and developed for the region, with Great Lakes-customized products,” she said. 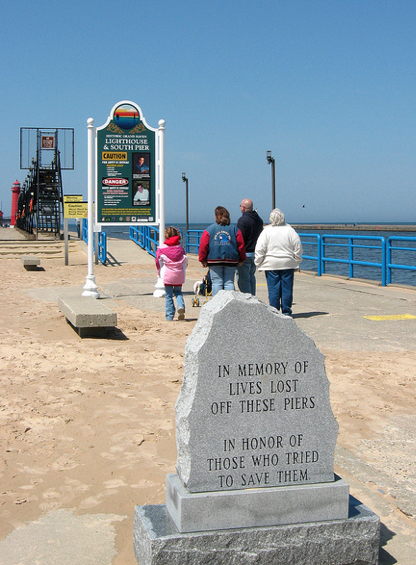 Since 2010, 384 people have drowned in the Great Lakes, according to data from the Great Lakes Surf Rescue Project. Summer drownings are often attributed to dangerous currents and accidents near piers when people jump off of them or decide to swim near or under them. Boating incidents and failed rescue attempts also contribute to these numbers. “Everyone needs to be more aware of water safety,” said David Benjamin, executive director of public relations for the Surf Rescue Project, a nonprofit organization that works to reduce Great Lakes drownings. While many of these tips are common sense, he said a panicked swimmer can get into serious trouble. “Unfortunately, a drowning individual is going to have to do that assessment when they’re terrified for their life, unless they start thinking about water safety before they even get in the water, and designate their possible exits if they were to get out into water over their head,” he said. The Be Current Smart campaign addresses the leading dangers of swimming in the Great Lakes, but spreading this information is easier said than done, said LaPorte. One issue is the region’s small number of lifeguards. To address the challenge, LaPorte and her team have turned to social media. They’ve created a Facebook app and the #currentsmart hashtag on Twitter that provides beachgoers and their families with safety tips. Life saving equipment. Image: Michigan Sea grant. The most important thing such an organization can do with social media is know their audience — and make sure their content appeals to that demographic, said Cliff Lampe, an associate professor and social media expert at the University of Michigan. The website and social media target young people — specifically males, who are in more danger of drowning due to their likelihood of engaging in high risk behaviors — and families with children, two categories that are high users of Twitter and Facebook. Lampe said that the campaign’s use of Facebook and Twitter are on mark, although he suggests reaching out to sites such as Reddit could further engage the young male demographic. “There’s potentially a lot of family activity on Facebook, and young males are part of the highest population of Twitter users,” Lampe said. 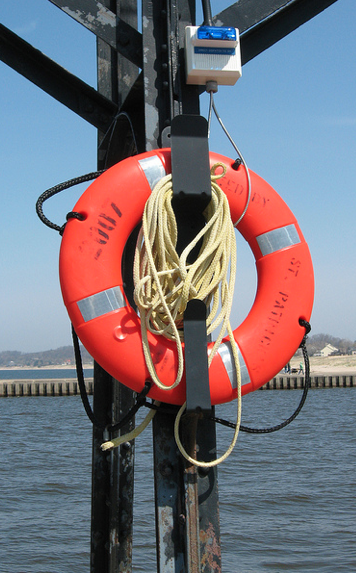 Be Current Smart features videos on topics like how to escape from dangerous currents, why jumping off piers is a bad idea and the value of lifejackets and other floatation devices. The website links to more in-depth information on dangerous currents and to water conditions and advisories from the National Weather Service. “So if you want to dive deep and learn more, that’s how you can do that,” LaPorte said. Great Lakes Echo will occasionally feature the safety videos throughout the summer as public service announcements. Those interested in learning more can visit www.currentsmart.org, join the conversation at #currentsmart on Twitter, or check out the Michigan Sea Grant Facebook page to subscribe to a Current Smart mailing list for updates.